Belvedere Drive resident Theresa Brophy spoke about her upbringing in the city she loves dearly. THANKFULLY for city native Theresa Brophy, she has never had to worry about rural living. Affectionately known as Tess to those closest to her, she was reared just off Ballybricken at Trinity Square and fortunately, she continues to live in a busy part of the city surrounded by not only neighbours, but friends, at Belvedere Drive. Two lovely areas to live, she says happily, although her current home isn’t as hectic as the neighbourhood she grew up in. 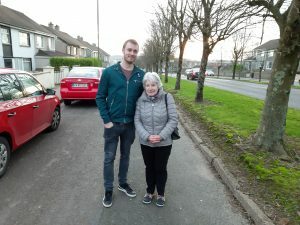 Speaking of her childhood, she recalls young boys trying to evade the attention of the Gardai who would cycle around the city on the lookout for pop-up football matches on the streets. Thankfully, she recalls, they knew the lay of the land and had the leniency of the locals to help them stay out of trouble. “All of the doors would be left open for the young fellas, including my own two brothers, to run through the house and hop in over the walls to get away from the guards. The girls, she states, also had to create their own sources of enjoyment and despite their limited resources, they were never left bored. Ballybricken at the time, was a thriving corner of the city, none more so than when the fair rolled into town, which inadvertently led to Theresa’s first job, of sorts. One of six children, she was the youngest with her nearest sister five years older than her. Her parents got married in Ballybricken Church but unusually, wouldn’t see each other for the next four years, although it could have become an eternity. Theresa’s Dad, a member of the British Army, would become a prisoner of war in Dresden, Germany during World War Two. Thankfully, following a period of recovery in England, her Dad returned to Ireland after the war’s conclusion, and their family would be created and grow in the coming years. While Irish and maths were never her cup of tea, she did love reading, although this was instilled in her by her father as opposed to her teachers. At around 16, she left to work in Lilly White’s on High Street where they made tennis rackets and hurleys. After a couple of years however she set off to join her two sisters in London, hopping aboard the Great Western on the Quay near where the Tower Hotel stands today. In 1960, she returned to her beloved city after her marriage and the thought has never crossed her to leave again. Walking up Paddy Browns Road last Tuesday afternoon having picked up a few bits and pieces in the shops, she ponders why she feels she belongs in Waterford and the residents of the homes we pass are a large part of that.